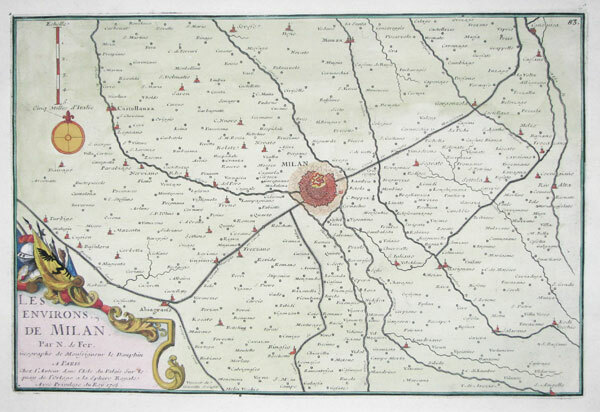 Paris, Lamarche, 1795. 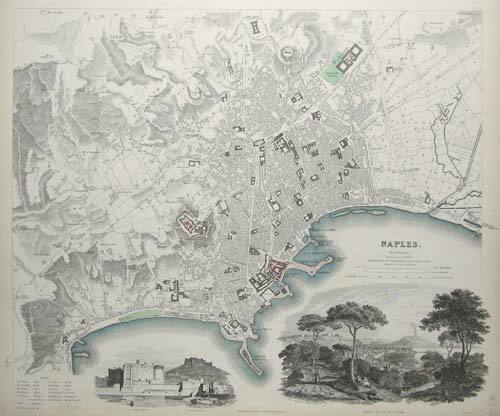 Map of the Kingdom of Naples, covering Southern Italy, with an inset of Sicily. Published in Year Three of the French Republic. London , J. & F. Tallis, c.1851. Map of south Italy, with Corsica, Sardinia & Sicily with engraved vignette scenes, including Carnival, Festival of the Vintage and a view of Naples and Vesuvius. Cologne, c.1588. A map/view of Bologna in Italy from the north, published in the 'Civitates Orbis Terrarum'. Amsterdam, Jodocus Hondius, 1616, First edition. Hondius engraved new plates for his edition of the Bertius atlas 'Tabularum Geographicarum Contractarum', which he sold alongside the Mercator 'Atlas Minor'. London: Baldwin & Cradock, 1834. Detailed plan, with elevations of the important buildings under the map. Paris, 1700. 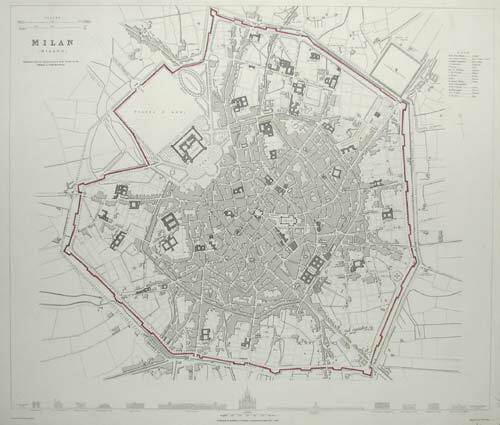 Town plan of Milan, with the defensive walls of the city shown and an extensive, 140-point key. With a separate sheet of engraved text. Paris, 1705. Map of the environs of Milan, with the defensive walls of the city shown. 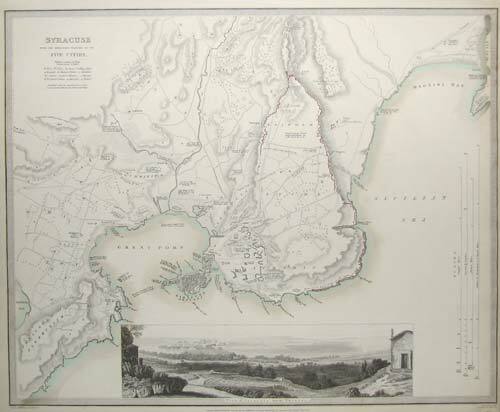 London: Baldwin & Cradock, 1832. Detailed plan, with elevations of the important buildings under the map. Nuremberg, c.1730. 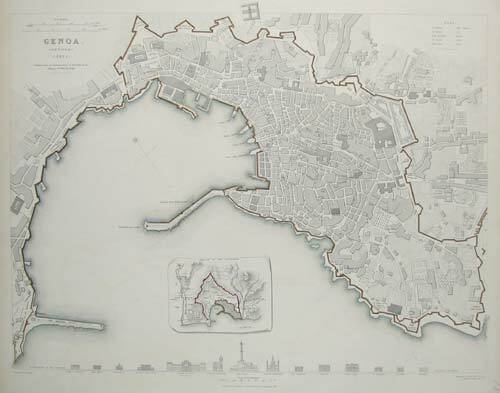 Plan of Naples with an 84-point key. Above and below are eight insets: a map of the environs and seven views, including Vesuvius. London: Baldwin & Cradock, 1835. Detailed plan, with two prospects under the map. Amsterdam, 1642, Dutch text. Sardinia, a smaller-than-usual map printed on a text-page of Blaeu's 'Theatrum', with a description of the island. Amsterdam, Pierre Mortier, 1705. 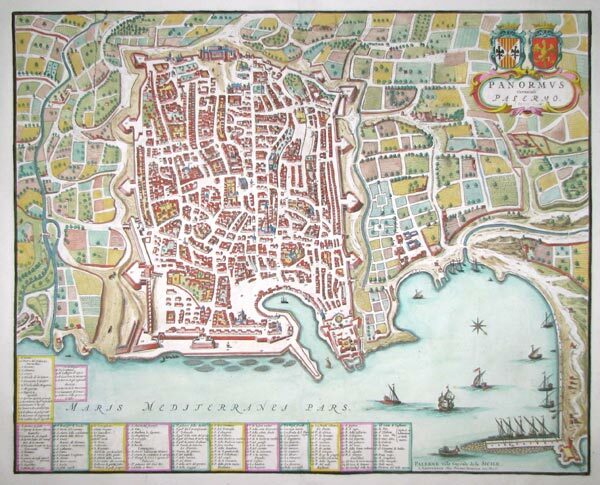 An uncommon map-view of Palermo in Sicily, with an extensive 162-point key. In 1663 Johannes Blaeu published his three-volume 'Townbooks of Italy', with this map appearing in the third volume, which focused on the Kingdom of Naples and Sicily. After Blaeu's death and the disastrous fire at his publishing house, the plates for the atlas were bought by Pierre Mortier, who added his own maps to the series and republished it as a four-volume set. Amsterdam, Covens & Mortier, c.1740. Large and detailed map of Sicily, with an inset of Malta & Gozo. London, 1745. Engraved by Basire for 'Mr. Tindal's Continuation of Mr.Rapin's History of England'. Paris, 1779. 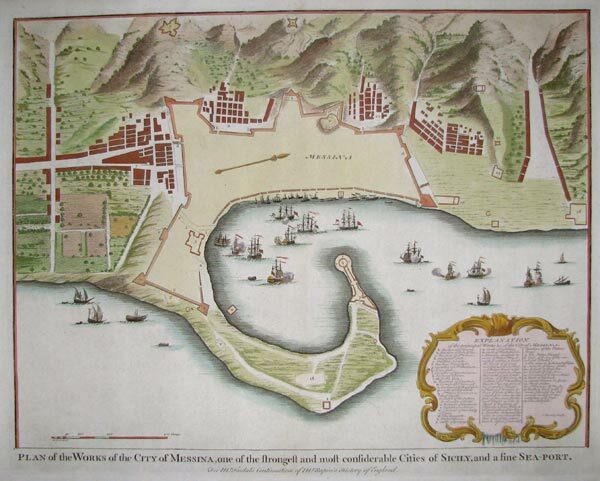 Chart of the harbour of Messina, with depths marked, published in Roux's 'Plans et Rades de la Méditerraneé'. London: Longman, Hurst, Rees, and Orme, 1807. Map of the Roman province of Sicily, published in the 'Geographi� Antiqu�'. London: SDUK, 1939. Detailed plan, with a prospect under the map. London. c.1805. 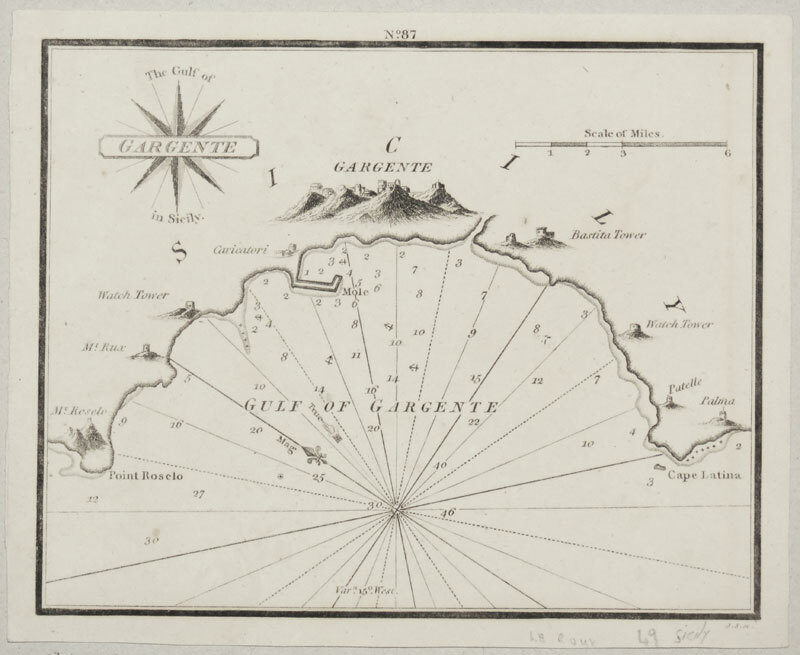 From an English edition of Roux's sea atlas of port plans. London: Baldwin & Cradock, 1833. Detailed plan, with three views under the map.